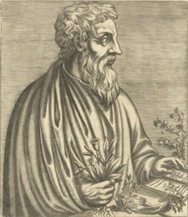 Dioscorides was an ancient Greek physician, pharmacologist and botanist who practiced in Rome at the times of Nero. He had the opportunity to travel extensively, seeking medicinal substances from all over the Roman and Greek world. He gained fame for writing his five-volume work De Materia Medicina. The book, in addition to becoming one of the most influential works on herbal use in history, became a precursor to all modern pharmacopoeias. In it, Dioscorides catalogs the different herbs and techniques used by the Greeks, Romans, and other cultures he studied. The book remained the cardinal source for information on herbal medicine until 1600. In the 2nd century BCE, Dioscorides was said to have noted, "Lead makes the mind give way." Incredibly, the first government bans of lead did not take place until the early 1900s. In 1909, France, Belgium, and Austria banned white lead-based interior paint, and in 1922, the European League of Nations banned leadbased paint. This was a precautionary approach that protected child health by preventing lead poisoning. The US did not ban lead-based paint until 1978, and even today, lead is still found in some consumer products. Steven G. Gilbert and Bernard Weiss. A Rationale for Lowering the Blood Lead Action Level From 10 to 2 µg/dL. Neurotoxicology Vol 27/5, September 2006, pp 693-701.